You’ve found the perfect match! 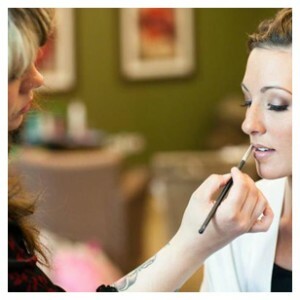 I am an Indiana makeup artist, specializing in wedding makeup for brides and bridal parties. I offer airbrush foundation and false lashes with every makeup application and am confident that the makeup I do will withstand even the hottest summer temperatures and all of those happy tears! I consider myself to be an approachable artist, who is very easy to work with. I’m also incredibly patient and organized, and am often told that I bring a calm presence to the wedding day. I will also make things easy for you, by setting up a suggested makeup timeline, based on the number of girls having makeup done and the time you need to be ready for pictures. This will ensure that we have plenty of time for you and your girls on that day, and you won’t feel rushed. As you begin planning your wedding, I will also be happy to help you by referring other trusted wedding vendors! Please don’t hesitate to ask if you need recommendations for hairstylists that will work on location, photographers, videographers, florists, DJs, etc. My passion, when it comes to the makeup industry, is working with brides! I hope to be given the opportunity to make you feel prettier than ever on your wedding day. I care about my brides & do everything I can to make sure that they are 100% happy with my work. I can honestly say that just about every bride I work with ends up feeling like a friend by the time we’re done! Popular dates during peak wedding season (usually Saturday dates, April-October) are often booked 12-18 months in advance. Please don’t delay if you are interested in using my services, as it is better to be in touch sooner than later. Dates are reserved with a signed contract and payment of $100.00 non-refundable retainer. The remaining $100, with any associated travel fees, will be due at the makeup preview. Any additional applications need to be paid in full at the time of service on the wedding day. Services may always be added if time allows, but no applications may be subtracted from the signed contract. **Please note due to the high demand for on location services, there is a 6 person minimum (bride +5) for Saturday bookings. A 5 person minimum (bride +4) will apply for Friday weddings. The minimums can be met by any person (does not exclusively pertain to bridal party members). It can include mom(s), grandmothers, personal attendants, etc. This 6 person minimum applies to locations within approximately 25 miles of Schererville, IN (including, but not limited to: Dyer, Highland, Munster, St. John, Crown Point, Cedar Lake, Griffith, Lowell, Merrillville, Hobart, Hammond, Valparaiso, Chesterton, Portage, etc.). I am absolutely willing to travel beyond those limits, but the minimum # of makeup applications will increase to 7+ people, depending on the additional distance and a minimal travel fee may apply. I will also travel to “The Allure” in LaPorte and “Sandy Pines” in Demotte, free of any additional mileage charge. Client is also responsible for any associated travel fees such as tolls/parking. Closer to your date, we will meet @ the salon I work out of in St. John, IN and do a makeup preview. We will do a full consultation and work together to create your wedding day look. I want you to be confident and excited about the way that your makeup will look on the wedding day & I will make sure that you are before you leave the trial. I encourage my brides to bring in any pictures that you would like for me to reference to. This can include pictures of makeup looks that you like, pictures of yourself and how you typically wear your own makeup, wedding color swatches, pictures of your dress/bridesmaids dresses, flowers, or anything else that will help me bring your vision to life! I also encourage you to wear something white, so that we can see how the makeup will look next to a white wedding dress. Due to the fact that weekends are reserved for my wedding bookings, trial runs are done by appointment, Monday-Thursday. I can arrange to do evening appointments, but I strongly encourage daytime appointments if possible, so that we can take advantage of using natural lighting. I do the wedding day makeup in natural lighting, and it is ideal to have the lighting as similar as possible for the trial. 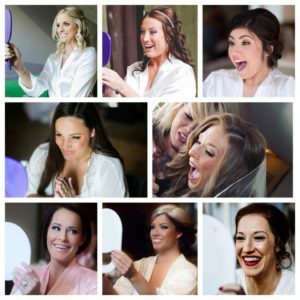 I realize that your choice of makeup artist can have a profound impact on how you feel during the start of your wedding day. I am very confident in my artistry, but also in my ability to bring a lighthearted and calm presence to the “getting ready” portion of your day. I promise to be timely, considerate and always professional. I am definitely a “people person” and something I enjoy most about what I do is getting to know my brides & their bridal party members. I LOVE to be around love!! There are few things more heartwarming than being with a bride on her wedding morning, making her feel pretty, while she is surrounded by her closest girls & family members. I have laughed and cried with many of the clients in my chair and truly feel blessed to be a part of such a special day. Choosing me to provide makeup services for you is something that I take very seriously, and consider the highest honor. A detailed consultation will take place at your trial run appointment. During this consultation we will discuss your wedding day details, which will be taken into consideration as I am coming up with the makeup look. Just a few of the things that we will discuss will be your wedding day color palette, dress style & color, bridesmaid dresses, flowers, wedding theme (if applicable), comfort level with makeup, etc. I will also want to view any color swatches that you have for the wedding & reference to any pictures that you would like to show me. I definitely encourage my brides to bring in reference images of make up looks that you love. While it is not mandatory, it does definitely help to put us on the “same page” and will give me a better idea as to what your vision is for that day. ** Please note, the trial run will need to take place on a weekday (M-Th), as the weekends (Fri/Sat) are reserved for wedding bookings. I will travel to your location of choice on the wedding day, but you will be asked to come to me for the trial run.The trial run is done at the salon I work out of in St. John. Also, while it is not mandatory, I prefer (and advise) that we do the trial during daylight hours, so that we can take advantage of using natural lighting (since that is the lighting I will want to do the makeup in on the wedding day). **Please note, I do require a minimum of 6 people for Saturday bookings (5 person minimum for Friday weddings), in order to book this service. (see additional pricing under “Attendants” tab) This 6 person minimum applies to locations within approximately 25 miles of Schererville, IN (including but not limited to: Dyer, Highland, Munster, St. John, Crown Point, Cedar Lake, Griffith, Lowell, Merrillville, Hobart, Hammond, Valparaiso, Chesterton, Portage etc.) . I am absolutely willing to travel beyond those limits, but the minimum # of makeup applications will increase to 7+ people, depending on the additional distance. A small travel fee ($1.00/mi) will also apply to those locations outside of the 25 mile radius, with the exception of brides who are getting married at “The Allure” in Laporte and “Sandy Pines” in Demotte. Travel fees are waived for those locations. Please email me here: krissy@krissyv.com to inquire about my availability! I am happy to answer any questions that you have. Makeup for each additional person is $80. MINIMUMS: There is a 6 person minimum for any on location wedding booking within Northwest Indiana (unless otherwise discussed between the artist & client) **PLEASE NOTE: This 6 person minimum applies to locations within approximately 25 miles of Schererville, IN (including but not limited to: Dyer, Highland, Munster, St. John, Crown Point, Cedar Lake, Griffith, Lowell, Merrillville, Hobart, Hammond, Valparaiso, Chesterton, Portage etc.). I am absolutely willing to travel beyond those limits, but the minimum # of makeup applications will increase to 6 people, depending on the additional distance. TRAVEL: There will be NO travel fees for destinations within 25 miles of my location (Schererville, Indiana). Travel to locations outside of these limits will require a 7+ person minimum for makeup, depending on the distance. Additional standard mileage rates will apply for locations outside of the 25 mile radius (currently $1.00/mi), with the exception of brides who are getting married at “The Allure” in Laporte and “Sandy Pines” in Demotte. Travel fees are waived for those locations.